It was supposed to be Paul Spadafora's crowning moment after years of being irrelevant in the fight game. Venezuela's Johan Perez had other plans. On Saturday night at the Mountaineer Casino Racetrack and Resort in Chester, West Virginia, the "Pittsburgh Kid" fought valiantly, but came up short in his bid to reclaim a world title, dropping a twelve-round majority decision to Perez via scores 117-111, 115-113, and 114-114. While Perez caught Spadafora flush on occasion, Spadafora looked as if he was outworking Perez for the greater part of the rounds. 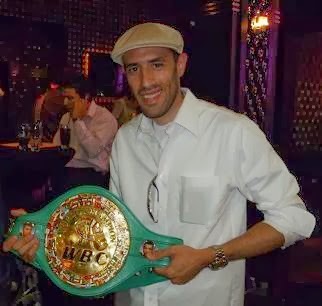 Perez (18-1-1, 12 KO's), 30, captured the interim WBA World junior welterweight title with the victory, positioning himself as the mandatory challenger for Danny Garcia's WBA Super World junior welterweight championship. In round one, Spadafora, an elusive southpaw, was methodical with his right jab. Known to be a slow starter, he controlled the tempo of the round. During round three, Spadafora hit Perez with many straight lefts to the body, and followed up by striking him with right hooks to the head. Yet, Perez stayed right in his face, applying relentless pressure. In the fourth round, Spadafora suffered a cut above his left eye. Perez was punching with him, landing clean, effective shots. Spadafora connected with a sharp left uppercut in round five, controlling distance for most of the round. With the cut above his left eye bleeding more during round six, Spadafora kept hammering away to Perez' body with straight lefts. Perez answered quickly with straight right-hand shots in succession. Then, Spadafora peppered Perez with a thunderous right hook to the head. Perez crowded Spadafora further in the middle rounds. Nevertheless, Spadafora rallied with a pair of crisp right hooks. However, Perez was undeterred, firing bombs toward Spadafora's head. Spadafora responded again in the ninth round with a series of well-timed body shots. Both men waged war in the championship rounds. Spadafora got some grueling body punches in on Perez in the tenth round, while Perez never let Spadafora breathe in the eleventh. Spadafora ripped off an abundance of body shots in the twelfth and final round, as Perez kept charging at him. The 38-year-old Spadafora (48-1-1, 19 KO's) sustained his first loss as a professional. Had Spadafora won, he would have tied heavyweight legend Rocky Marciano with 49 wins and no losses. Perez has now won three in a row, his only professional loss coming at the hands of Pablo Cesar Cano via seven-round technical decision on July 21, 2012 in Mexico due to an accidental clash of heads. In the co-main event, Wilkins "The Hispanic Hurricane" Santiago (9-0-1, 1 KO) and Eric Draper (8-6-1, 3 KO's) struggled to a six-round draw in an uninspiring match-up. Santiago, 33, and Draper, 36, each received a 58-56 score in their favor, as well as an even 57-57 tally. Santiago, rocked Draper in the first and third rounds with accurate, looping right-hand shots. However, Santiago was unable to capitalize on his momentum versus the towering, long-legged Draper, who entered the bout on a four fight winning streak. In the fifth round, Draper cracked Santiago on the chin with a firm, straight right hand, driving him back into the ropes. However, Santiago responded by sending Draper into the ropes in the sixth round when he threw and connected with an arching, wide overhand right. Neither fighter possessed the power to close the show, although Santiago demonstrated that he has effective lateral movement in his arsenal. Morgan "Big Chief" Fitch (11-0-1, 5 KO's) and veteran Darnell "Diesel" Boone (19-21-4, 8 KO's) fought to a six-round draw in a super middleweight clash. Boone received a tally of 58-55, while Fitch got a 57-56 score. The other scorecard was even at 56-56. In round one, Fitch, 30, pressured Boone by utilizing a stinging left jab, which enabled him to land blistering punches while Boone was trapped on the ropes. There were moments where Fitch gave up his height and reach advantage, although he managed to strike Boone with multiple flurries. Fitch found his range better in round three, however, Boone let go a vicious uppercut, flooring the young fighter instantly. Fitch recovered and finished the round on his feet. Early in the fourth round, Boone sent Fitch to the canvas once again with a devastating right-hand shot.It appeared the fight was over, but Fitch rose to his feet one more time. After a right uppercut from Boone stunned Fitch again, he somehow managed to regain his legs. Fitch closed the round by nailing Boone with a right cross. Boone appeared slightly tired in the fifth round, while Fitch picked up the pace. Boone used his left jab and lateral movement more in the sixth round, although Fitch continued to apply heavy pressure. In light heavyweight action, Dustin Echard (8-0, 5 KO's) remained unbeaten, winning a four-round majority decision against Thomas Hanshaw (2-2, 2 KO's). Official score totals were 38-38 and 39-37 twice. The 27-year-old Echard found himself engaged in a highly competitive battle, scoring mostly with straight right hands. Both men showed the capacity to take a strong punch, and dished out punishing shots every round. Hanshaw's attacking style forced Echard back often, producing the razor-thin scorecard. Featherweight Antonio "Carita" Nieves (5-0, 2 KO's) needed just 1:28 seconds to dispose of Brian Ragland (0-1). From the moment the opening bell rang, Nieves found a home for his overhand right. Nieves sent Ragland crashing to the canvas with a scintillating right cross-left hook combination to the body. Ragland rose to his feet, but was quickly met with a rock-solid, right-hand shot to the body from Nieves that immediately ended the bout. Light heavyweight prospect "Iron" Mike Snider (2-0-1, 1 KO) outpointed "Dangerous" James Denson (5-16, 2 KO's) 39-37 on all scorecards in a four-round grudge match. Snider opened the fight behind an aggressive left jab. He momentarily trapped Denson in the corner, and unleashed a series of body blows during round one. In round two, Denson connected with a short left hook to Snider's head. Shortly thereafter, Denson wobbled Snider with an overhand right, prompting him to clinch. Snider bounced back in round three, throwing wild punches. As a result, Denson's punch output quickly dropped. Snider simply outworked Denson in the fourth and final round, scoring repeatedly with solid body shots. Both fighters exchanged swift punches in the final twenty seconds.